The Saujana Hotel Kuala Lumpur is one of only few resort style hotels in the Klang Valley. Sitting on 160 hectares of lush tropical forest and gardens with a lakeside view, this 250-room hotel with two adjoining 18-hole championship golf courses is an idyllic haven for business and pleasure. We were here to review their All You Can Eat Weekend Dim Sum Brunch at Ti Chen Chinese Restaurant. 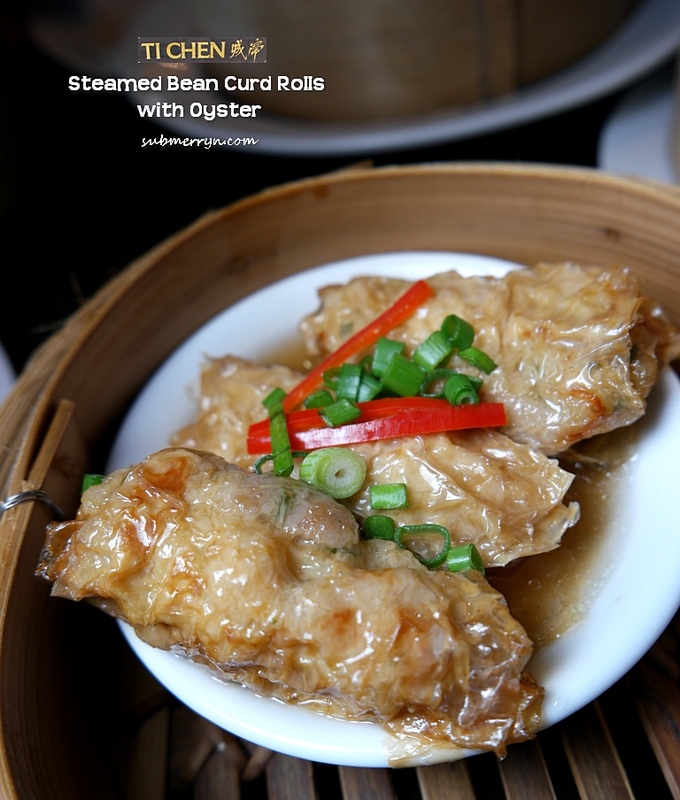 Located on the picturesque property of the Saujana Hotel Kuala Lumpur, Ti Chen has been serving its blend of Chinese cuisine for over 25 years. Ti Chen Chinese Restaurant used to be located in the vicinity of the golf course but has now moved to its new home by the lake. It is located just next to the swimming pool. My first step into Ti Chen feels like I am walking into a high end club with the bar greeting us. Several more steps inside and it now feels like I am in a posh western restaurant. As I continue my way in, I find my eyes slowly drawn into the beautiful oriental design of the ceiling. Overall, this place exude a modern charm of the orient. I love the generous space in here with plenty of natural lighting. They also have a private room should you wish to dine with privacy. As soon as we were seated, we were served this luxurious Braised Eight Treasures with Atlantic Crab Meat Soup each. After warming our stomach with that nutritious soup, we proceeded to place our orders as the dim sums here are made to order to ensure freshness. I took a peak at their open kitchen to see these piping hot dim sums being prepared upon order. While waiting for our dim sums to be ready, I went to grab some appetisers. The Appetisers and Desserts are laid buffet style so we are free to help ourselves with them. As usual, the boys will definitely order the Steamed Glutinous Rice with Chicken, Salted Egg Yolk and Mushroom (Lo Mai Kai). I love these smiling snowy white buns with cracked top to bits. They are soft, fluffy and the filling is simply delicious with the mixture of sweet and slightly savoury chicken filling. One is not enough, I had TWO! Shhh…. Steamed Custard Bun with Cocoa Powder ♥ is a hit with the kids as it is soft, light and fluffy with sweet custard filling inside. I super love this. It’s NYONYA sauce! Need I say more? I had multiple servings of this collagen-rich phoenix claw. I was fooled into thinking this is pai kuat (pork ribs) but then I remember that this is a pork-free restaurant. Wow. This is really amazing stuff! The meat has a more refine and tender texture as opposed to pai kuat so I really love it. Steamed Pumpkin Cake (Fatt Gou) ♥ Soft, fluffy and melts in the mouth. Fragrant pastry on the outside with fresh real pineapple and custard filling inside reminds me of Chinese New Year already! Pan-Fried Crispy Chicken Bun with Herb aka Chi Kut Teh Bun! ♥ The entire room smells of the fragrant CKT herb when this was served. I prefer the flour rolls with prawn. Unlike the Steamed Chicken Wings that successfully give pai kuat (pork ribs) a run for its money, this BBQ Chicken Chee Cheong Fun just doesn’t make it compares to its porcine version, the Char Siew Chee Cheong Fun. When it comes to dessert, Ti Chen Signature “Tau Fu Hua” ♥ wins hands down! Ultra smooth tofu pudding with Chinese wolfberries sugar syrup. We each had multiple servings of this healthy and delicious treat. It is always a good idea to dine in a big group for ‘All You Can Eat’ promotions as we are able to sample a wider selections off their menu. The dim sums here are top notch, better than many other places we have sampled. Ti Chen’s All You Can Eat Weekend Dim Sum Brunch happens every Saturday and Sunday from 10.30am to 3.00pm. This pork free dim sum is priced at RM118 per adult and RM59 per child (6-12 years old)/senior citizen (above 60 years old). Is this on the way to the old Subang airport, past Subang Parade? Never go that way anymore since they moved the airport to Sepang. i still prefer pork dim sum than non pork anytime… non pork ones doesn’t give me the type of “kick” that i want. Different target market I guess. Pork-free dimsums such as this is great for makan meet-ups with business acquaintances. My hubby especially is always on the look-out for promos to treat his business associates. Everything looked so delicious. Nice golf course too. Love your boys photo there. I love dim sum but how much can I eat. Usually I take more steamers than I can handle. Hahaha. Oh, they relocate Ti-Chen which this formerly was Senja Restaurant. My wife and I love this hotel and used to stay over the weekend just to enjoy a short get away! The Dim Sum photos looked very delicious and appetizing.